If you've ever wondered what size a single pixel on a digital camera is, or how different sensor sizes effect image quality, then this article is for you. For a more basic introduction into what a sensor is, have a look at our Sensor Technology Guide. What difference does pixel and sensor size make? A larger sensor is better, as this allows larger pixels on the sensor, which in turn helps record more light. A larger sensor will also allow the manufacturer to offer a wider ISO range, and the camera will be able to shoot at higher ISO speeds, whilst keeping noise low. 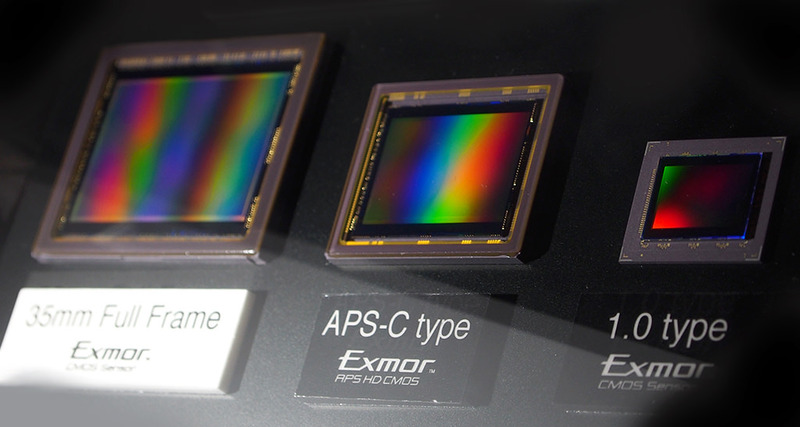 For example, a Full-Frame sensor is bigger than an APS-C sensor, and an APS-C sensor is larger than a Micro Four Thirds sensor, and therefore the larger the sensor, the larger the light collecting area, and the larger the pixels will be, assuming all sensors are the same megapixel count, and use the same sensor technology. The more pixels you put on a sensor, then the smaller the pixel will be. For example an 18 megapixel sensor will have smaller pixels than a 12 megapixel sensor, assuming both sensors were exactly the same size. The size of each Pixel is measured and shown as a Micron with the symbol μm or simply μ, and is short for micrometre (Wikipedia). Pixel size ranges from 1.1 microns in the smallest smartphone sensor, to 8.4 microns in a Full-Frame sensor. 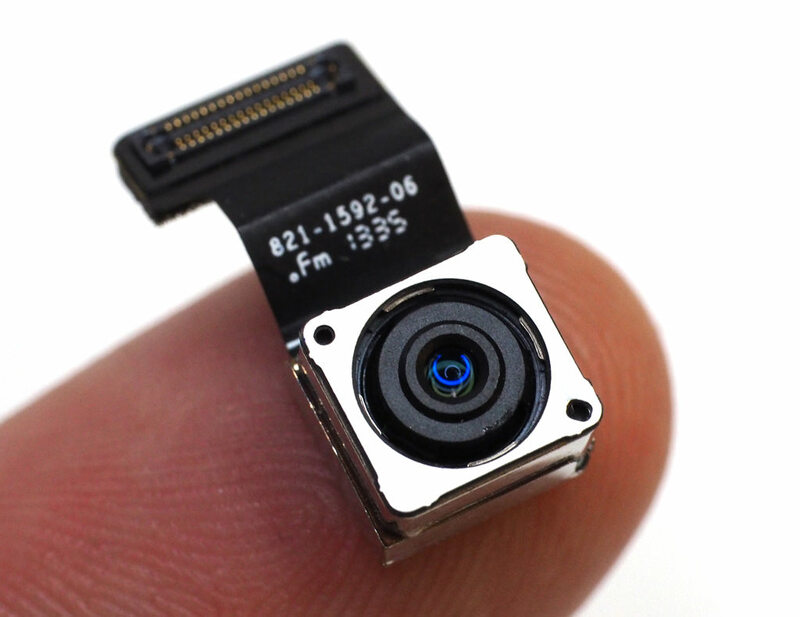 As an example, the 8 megapixel sensor above has a resolution of 3,264 x 2,448 pixels, with 327,184 pixels in an area just 1mm x 1mm in size. We've previously looked at sensor size, but are going to look at sensor size in more detail, going down to the pixel level. Does sensor technology and type matter? Another consideration is whether the sensor is a BSI (Back Side Illuminated) CMOS sensor, a standard CMOS sensor or a CCD sensor. A BSI sensor has the wiring moved out of the way, which means the individual light gathering areas of the pixel can be larger, allowing more light to reach them, giving better low-light performance, as well as improved dynamic range. You also need to be aware of the advances made in sensor technology over the years, with manufacturers continually working to reduce image noise, and improve sensor performance. 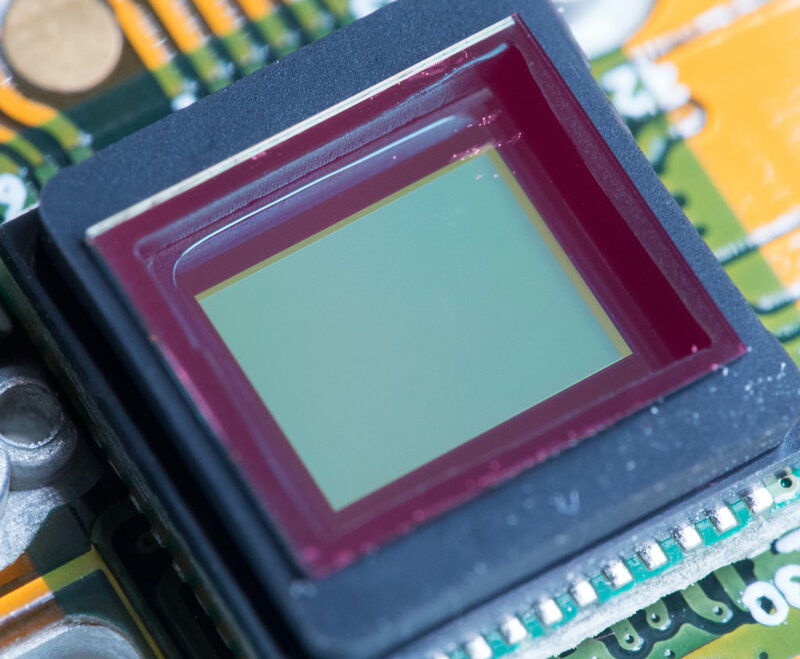 We look at the different technology, such as CCD, CMOS, and BSI sensors in our guide to digital image sensor technology, and if you're looking for additional information on sensor types this would be well worth reading. Nb. If you're looking for the best sensor for low-light, then you should also be aware that the lens aperture affects low light performance, a larger aperture is better (ie. f/1.7 is better than f/3.3), and optical image stabilisation (OIS) can also help get sharp shots in low light, for example, when using slower shutter speeds. Sensor technology and size is one aspect of image quality, with the lens, and image processing of the camera also playing an important part in producing the final image. Here we compare different camera sensor sizes found in the different types of camera, including smartphones, compact cameras, mirrorless cameras, Digital SLRs and medium format. We will be showing sample images, and as the sensor (and pixel) size increases, you can see for yourself how noise is affected. The sensor in a smartphone can vary in size from phone to phone, and smartphones often feature the smallest sensors available. The compact size of smartphones means that they very rarely feature any optical zoom, instead they often opt for a prime lens, with a bright aperture, or alternatively more than one camera to enable additional features, such as wide-angle lenses, or dual cameras etc. Most smartphones feature a small sensor and a limited ISO range, with many smartphones having a maximum ISO speed of ISO800, and ISO1600, although sometimes they will offer higher ISO speeds. This can mean smartphones struggle in low-light unless they feature a bright aperture, optical image stabilisation, or other features to help in low-light situations. The exception is the Panasonic Lumix CM1, which features a 1inch sensor. There's also the Nokia PureView 808 which features a 1/1.2inch sensor. For more on smartphones, have a look at the Top 10 Best Smartphones for Photography, or look at more smartphone reviews. 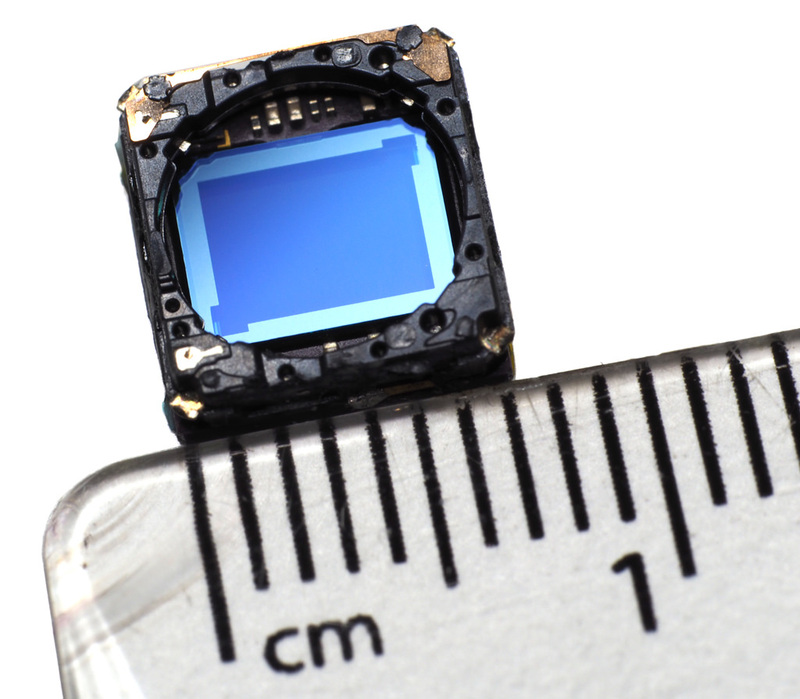 The sensor above from a Vivitar Vivicam 8370, is an 8mp 1/2.5inch CMOS sensor with a width of 5.7mm, a resolution of 3264x2448, and 1.74 micron pixel size, meaning a line of 572 pixels takes up 1mm. Compact camera sensors vary in size from 1/3inch to 1/1.7inch or larger. We look at larger compact camera sensors in the next section on premium compact cameras. The latest BSI CMOS sensor compact cameras offers a wide ISO range from ISO100 often up to ISO6400. With a few exceptions, there aren't many compact cameras with larger than normal pixels, and we would consider 1.5 microns and larger as being big for a compact camera. When you switch over to the next level up, the premium compact camera, you often find a larger sensor for improved image quality. For more on compact cameras, have a look at our Top 10 Best Pocket Zoom cameras, or have a look at more compact camera reviews. With the introduction of a 1inch sensor in the Sony Cyber-shot RX100 in 2012, Sony introduced a compact camera with a larger than normal sensor, for improved image quality. Sensor sizes ranges from 1inch to APS-C in premium or advanced compact cameras, and more recently Full-Frame sensors have been used in compact cameras with a fixed lens. The 20 megapixel 1inch BSI sensor is used in a number of cameras, including the Sony Cyber-shot RX100 II, the Panasonic Lumix FZ1000, TZ100, and Canon Powershot G5X, G7X Mark II etc. The Sony Cyber-shot RX100 II has a bright variable aperture zoom lens, 2.4 micron sized pixels, and a 20mp BSI CMOS sensor. The 20 megapixel Micro Four Thirds sensor is larger, features 3.3 micron sized pixels, and APS-C sensors feature even larger pixels. 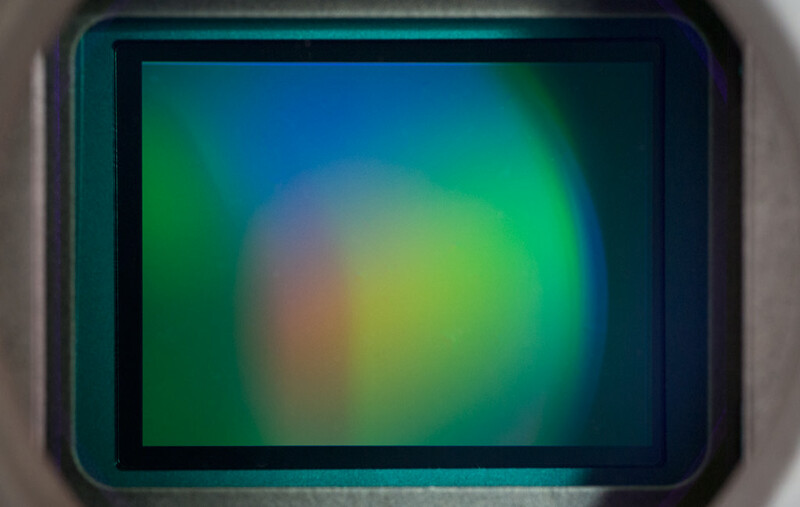 For the largest pixel size there is the option of a Full-frame sensor, however, this also results in a larger camera, with larger lenses as well. The increase in size of sensor from a compact camera to a 1inch sensor, has seen an impressive improvement in noise performance, with a sensor roughly 4 times larger than the typical compact camera. For more information on premium cameras with a larger sensor, have a look at the Top 10 Premium Serious Compact Cameras. When Olympus (and others) introduced the Four Thirds system, they used a smaller sensor size compared to APS-C, with a 2x crop factor, as they saw a benefit in creating a smaller camera system. In the beginning they suffered with noise performance, mostly due to the use of Kodak CCD sensors, but as time went on, the noise performance of Micro Four Thirds sensors began to catch up with APS-C sensors, and as the megapixel count of APS-C sensors increased further, the gap between them became less. Four Thirds cameras used to offer a limited ISO range, however, this quickly changed with Micro Four Thirds cameras offering high ISO speeds. For more Micro Four Thirds cameras, have a look at the Top 13 Best Premium Mirrorless Cameras. The APS-C sensor varies in size depending on the camera it is in, with Canon APS-C sensors slightly smaller than other APS-C sensors. There are also APS-H sensors used in other cameras from Sigma and Canon. Note – for the most common resolution APS-C cameras, there is little difference in pixel size between a 24 megapixel APS-C camera (with a 3.9 micron pixel size) and a 16 megapixel Micro Four Thirds camera (with a 3.75 micron pixel size) – which should mean that ISO performance of both should be relatively similar (assuming sensor technology used in both is similar), although there is a slightly larger pixel on most 24mp APS-C cameras, and the sensor is also physically larger. Comparing the Canon EOS 760D with a 24mp APS-C sensor, it has smaller pixels at 3.7 microns, compared to a 16mp Micro Four Thirds sensor, with 3.75 microns, which means that Micro Four Thirds cameras could in theory produce better noise performance than Canon’s sensors. (Due to Canon using smaller 1.6x crop APS-C sensors than other manufacturers). For more Digital SLRs with APS-C sensors, have a look at the Top 10 Best APS-C Digital SLRs. Offering larger pixels, the Full-frame (FF) sensor is available in a number of resolutions, with popular cameras often offering a 24 megapixel sensor, which gives large 6.0 micron pixels, and often an extended ISO range going up to ISO51200. You can also go for a high resolution sensor, up to 50 megapixels, whilst still having relatively large 4.1 micron pixels. 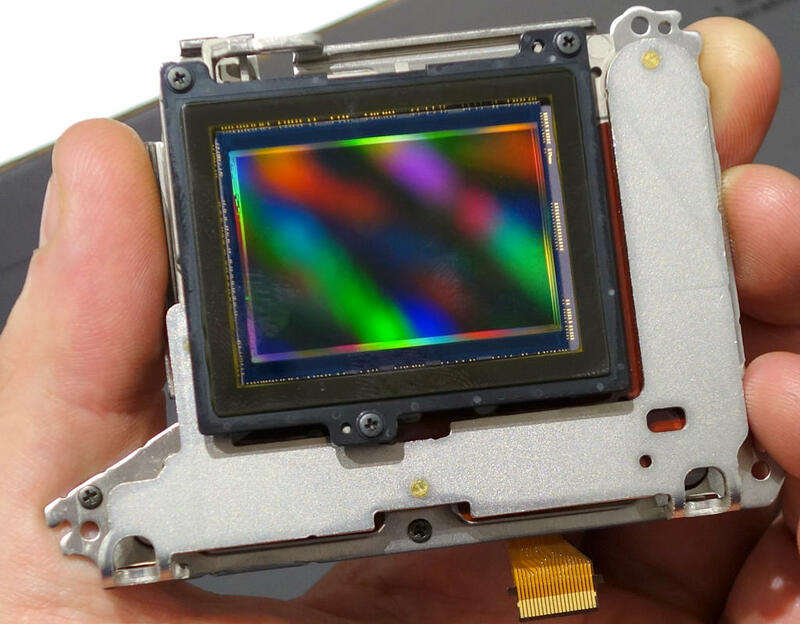 The Full-frame sensor is also capable of using the full image of a full-frame lens, something cameras with smaller sensors are unable to do (without additional adapters). The full-frame sensor offers larger sensor size and larger pixel sizes than APS-C, and as the resolution increases the pixel size drops, but even the 50 megapixel sensor has larger pixels than a 24mp APS-C sensor. As the pixel size decreases, the ISO range available also tends to decrease, depending on how confident the manufacturer is in their noise reduction, noise performance, and sensor technology. The Canon EOS 5DS and 5DS R limit the maximum ISO speed to ISO12800, which is lower than the maximum ISO speed on a number of APS-C (and smaller) sensors. If you want a camera that has large pixels, then you can go for a 12 megapixel full-frame sensor, with large 8.4 micron pixels, and on the Sony Alpha A7S (and Mark II) the ISO range can be extended up to 4 million ISO. For more full-frame Digital SLRs have a look at our Top 10 Best Full-Frame DSLRs. 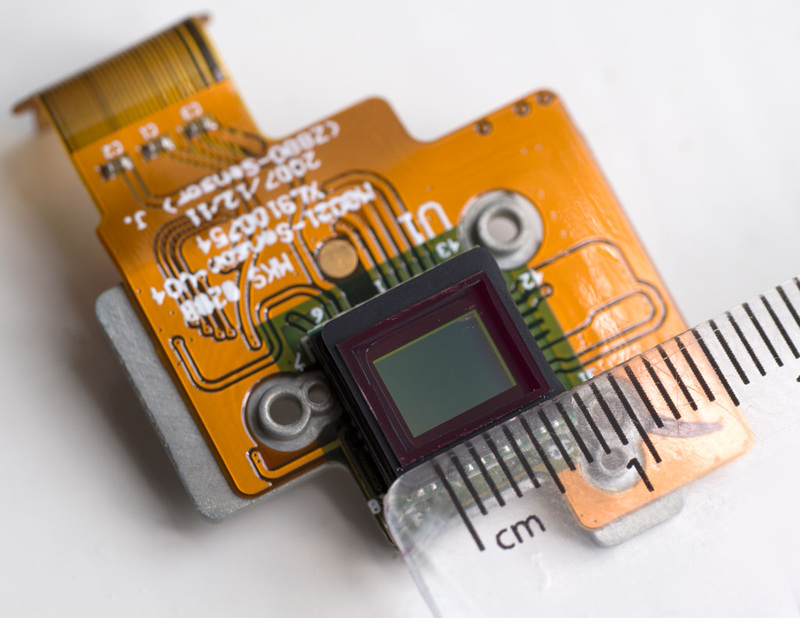 Medium Format digital cameras often use different sized sensors depending on the resolution of the sensor available, and more recently have been using CMOS sensors instead of CCD sensors. 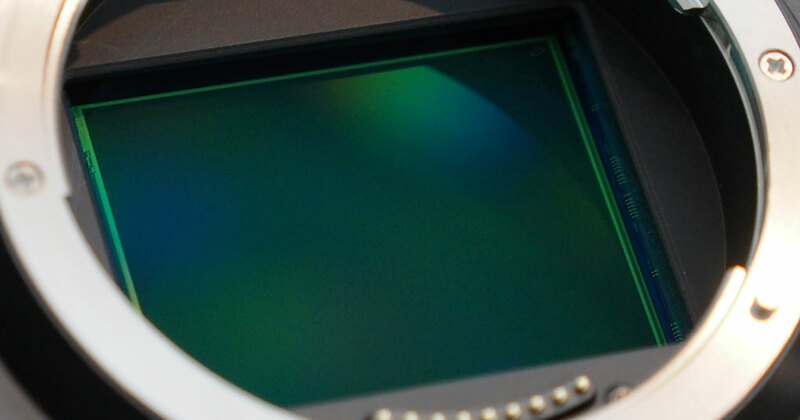 Due to the expense of medium format sensors, as well as the low number of sales of medium format sensors, medium format sensors often seem to be some of the last sensors to benefit from technological advances in sensor technology. Medium format cameras offer a larger sensor, but also a high resolution, which means that the priority isn't necessarily on low-light performance, as it is with some Full-frame cameras, but instead on high resolution. There are a number of CCD and CMOS sensors used in Medium Format cameras that have a limited maximum ISO speed, making them more suited to studio situations where you have control over light levels, and can ensure good lighting. The exception to this is the Pentax 645Z, which has a very high maximum ISO of ISO204800. A note on image examples: These are from the JPEG images from the camera, so there will be differences in how each camera has processed the file, with each camera applying it's own strength of noise reduction. There are also differences due to the camera's white balance performance. To calculate pixel size, you use the width of the sensor in millimetres divided by the image width in pixels, and multiply by 1000. Eg: 16mp Micro Four Thirds sensor, 17.3mm wide, divided by 4608, multiplied by 1000 (source). Guide to digital image sensor technology. Sensor size and crop factor. There's one or two misconceptions in this article. In general terms the biggest effect on light gathering [and therefore overall levels of noise] is the size of the sensor, not the individual sensel. The amount of information gathered is sensor area/aperture/exposure length = total light. A 35mm sensor at the same aperture and shutter speed will capture [more or less] four times the amount of light in the same circumstances [ie same ambient conditions/same aperture value/same exposure length] because the total area exposed is four times larger - irrespective of pixel pitch. It isn't quite so simple of course. What you miss out entirely in this article is the camera's image processor. These have become vastly more powerful in recent years with the advancement in microtechnology - and it's probably this as much as anything else [or at least as much as the improvements in sensor technology itself] which accounts for the progress in noise handling with sensors at any particular size. Sensel size [i]does[/i] matter, but only where ISO is boosted to high levels. So far as I understand it this is mainly due to shot noise - which isn't going to change because the physics doesn't. Every time you increase ISO by one stop you are halving the light sample each pixel is giving. As the photon flow decreases, because photon-strike is random scatter, it becomes more and more likely that each sample taken is unreliable. Noise processors are using ever more sophisticated algorithms to average out incorrect samples [which is what 'noise' is in this case], but when the light drops low, the number of flawed samples starts to increase dramatically so that these averages are fighting a losing battle. At this point the larger the light well [a good analogy is a bucket collecting rain spits], the more chance you have of getting an accurate reading. This is why small sensel sensors will get to a plateau of sensitivity more quickly than their larger counterparts. There's one or two misconceptions in this article. In general terms the biggest effect on light gathering [and therefore overall levels of noise] is the size of the sensor, not the individual sensel. The amount of information gathered is sensor area/aperture/exposure length = total light. A 35mm sensor at the same aperture and shutter speed will capture [more or less] four times the amount of light in the same circumstances [ie same ambient conditions/same aperture value/same exposure length] because the total area exposed is four times larger - irrespective of pixel pitch. It isn't quite so simple of course. What you miss out entirely in this article is the camera's image processor. These have become vastly more powerful in recent years with the advancement in microtechnology - and it's probably this as much as anything else [or at least as much as the improvements in sensor technology itself] which accounts for the progress in noise handling with sensors at any particular size. Sensel size does matter, but only where ISO is boosted to high levels. So far as I understand it this is mainly due to shot noise - which isn't going to change because the physics doesn't. Every time you increase ISO by one stop you are halving the light sample each pixel is giving. As the photon flow decreases, because photon-strike is random scatter, it becomes more and more likely that each sample taken is unreliable. Noise processors are using ever more sophisticated algorithms to average out incorrect samples [which is what 'noise' is in this case], but when the light drops low, the number of flawed samples starts to increase dramatically so that these averages are fighting a losing battle. At this point the larger the light well [a good analogy is a bucket collecting rain spits], the more chance you have of getting an accurate reading. This is why small sensel sensors will get to a plateau of sensitivity more quickly than their larger counterparts. "Sensor technology and size is one aspect of image quality, with the lens, and image processing of the camera also playing an important part in producing the final image." This article is looking at the sensor and pixel size. Not image processing. Person behind the camera matters the most. I dunno Josh, I think reading the above article could lead you to believe that sensel size is the most important thing in terms of IQ and the levels of noise you'll get out of your camera. The one line you quoted seems like a little aside. I think the important takeaway is that all other things being equal, a larger sensor will almost always give better noise performance. Pixel pitch becomes critical at very high ISOs these days. As you'll know yourself, in good light you can get a pretty decent image out of a smartphone. As sensor sizes increase there's a law of diminishing returns. You have to have a sensor four times larger than MFT [with the size implications for body and lenses that brings with it]. for a light advantage of around two stops. [I don't see it's much more than even with the preposterous specs of the D5]. Technological advances have meant that the differences between my 5DII and GX8 [or EM1] are now marginal at best, but I tend to think those advances pretty much crested with the likes of the D3s and we've seen pretty minor gains since. I don't think we'll see much more than incremental gains unless the there's some sort of paradigm shift [like multiple sensor arrays] in image capture. In the final analysis sensel size is really only very important in order to achieve [now] very high sensitivity - but the increase in size is exponential with the amount of gain. I dunno Josh, I think reading the above article could lead you to believe that sensel size is the most important thing in terms of IQ and the levels of noise you'll get out of your camera. The one line you quoted seems like a little aside. I think the important takeaway is that all other things being equal, a larger sensor will almost always give better noise performance. Pixel pitch becomes critical at very high ISOs these days. As you'll know yourself, in good light you can get a pretty decent image out of a smartphone. As sensor sizes increase there's a law of diminishing returns. You have to have a sensor four times larger than MFT [with the size implications for body and lenses that brings with it]. for a light advantage of around two stops. [I don't see it's much more than even with the preposterous specs of the D5]. Technological advances have meant that the differences between my 5DII and GX8 [or EM1] are now marginal at best, but I tend to think those advances pretty much crested with the likes of the D3s and we've seen pretty minor gains since. I don't think we'll see much more than incremental gains unless the there's some sort of paradigm shift [like multiple sensor arrays] in image capture. In the final analysis sensel size is really only very important in order to achieve [now] very high sensitivity - but the increase in size is exponential with the amount of gain. What happened to Fuji in the aps-c table? The article does mention aperture, and with interchangeable lens cameras, the easiest way to improve IQ in low light is to use a brighter lens. :D Another complicating factor is that newer design sensors tend to have a higher pixel count than their predecessors, so an older 12mp Lumix micro four thirds sensor for example will be out performed in low light by the newer 16 or 24 mp sensors despite having smaller pixels. What happened to Fuji in the aps-c table? The article does mention aperture, and with interchangeable lens cameras, the easiest way to improve IQ in low light is to use a brighter lens. Another complicating factor is that newer design sensors tend to have a higher pixel count than their predecessors, so an older 12mp Lumix micro four thirds sensor for example will be out performed in low light by the newer 16 or 24 mp sensors despite having smaller pixels. What then happened to dynamic range on the D500? If the article is 100 accurate (I do not believe it is) then the D500 cannot have at least as good dynamic range and better high ISO noise than the D750; yet it does. The current basics are at low ISO's for similar sensor technology there is no practical difference between FX and DX. The article overlooks that any decent current 4:3 body performs better than DX or FX of 5-6 years ago. The article seems to set out a point of view that in the real world has been largely confined to the waste paper bin of history. My view is anybody who talks about an upgrade (as distinct to a change) to a larger sensor is likely to have a closed mind when it comes to reality. What then happened to dynamic range on the D500? If the article is 100 accurate (I do not believe it is) then the D500 cannot have at least as good dynamic range and better high ISO noise than the D750; yet it does. The current basics are at low ISO's for similar sensor technology there is no practical difference between FX and DX. The article overlooks that any decent current 4:3 body performs better than DX or FX of 5-6 years ago. The article seems to set out a point of view that in the real world has been largely confined to the waste paper bin of history. My view is anybody who talks about an upgrade (as distinct to a change) to a larger sensor is likely to have a closed mind when it comes to reality. [quote]What then happened to dynamic range on the D500? If the article is 100 accurate (I do not believe it is) then the D500 cannot have at least as good dynamic range and better high ISO noise than the D750; yet it does. 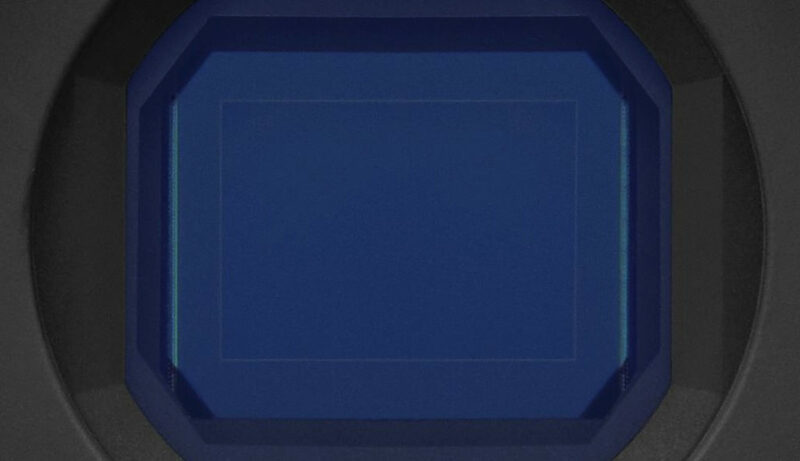 The current basics are at low ISO's for similar sensor technology there is no practical difference between FX and DX. [/quote] I don't know how many stops of dynamic range the D500 has vs the D750, but in terms of high ISO noise performance, if you compare both cameras at ISO 100k it's pretty clear the D750 is [i]far[/i] better - around 2 stops. Which is pretty much what one should expect. You're not just going on Nikon's figures of the cameras maximum sensitivity are you? Personally I wouldn't put those in a Christmas Cracker. Quote:What then happened to dynamic range on the D500? I don't know how many stops of dynamic range the D500 has vs the D750, but in terms of high ISO noise performance, if you compare both cameras at ISO 100k it's pretty clear the D750 is far better - around 2 stops. Which is pretty much what one should expect. You're not just going on Nikon's figures of the cameras maximum sensitivity are you? Personally I wouldn't put those in a Christmas Cracker. I think it's too easy to get bogged down with number of pixels, sensor sizes, processing engines etc etc...Go out and shoot, if you're happy with the results you are getting, regardless of sensor sizes & pixels, then it's good enough! I have plenty of old photo mags and it was many years ago they were singing the praises of Pro DSLRs with 4 then later 6 megapixels, saying how detailed & fantastic the images were! Of course, they had full frame sensors. I have several cameras, amongst them is the Sony RX100 mk3. I'm hard pushed to tell a quality quality difference in processed RAW files from my Olympus OMD EM1 (micro 4/3rds) and from the APSC DSLRs I had before them. How far we have come in the last 15 years! !